Click on the image to open a large version in a new window. This photograph was taken at the Brighton Borough Hospital sometime during 1944. My maternal Grandfather, Trayton Thomas Clarke (front row on the left) died there from Pulmonary Tuberculosis on New Year’s Eve 1944 aged only 52. He suffered years of recurrent, debilitating lung/chest problems, having been gassed in the trenches in WW1. Sadly, I never knew him as I was born a few months after his death, but I am told that he was a kindly, gentle man. 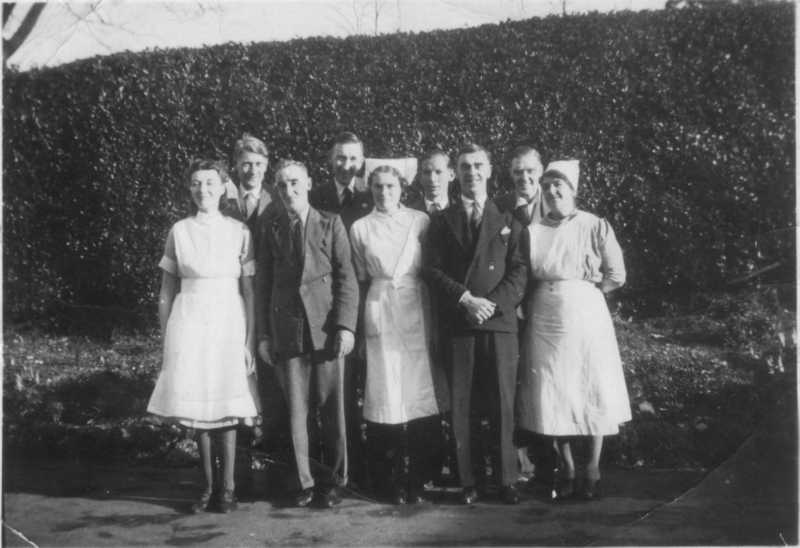 I do not know whether the other gentlemen in the photo are patients or members of staff, can anyone identify them? Perhaps one of the nurses was your Mother/Grandmother. Everyone there has a story to tell I am sure. If you recognise anyone here, please leave a comment below.